installed just south of the Katy Depot! A thirty-five foot long steel, railroad train sculpture entitled "Rag Tag History Train," featuring the history of the railroad in Sedalia and its sometimes raucous effect on the town, was unveiled April 22, 2004. Rag Tag was created by artist Christine Schilling in collaboration with hundreds of Sedalia school children. Scores of surprising train cars were designed by kids and then plasma-cut from sheets of steel. In honor of the statewide "Rails to Trails" project, the sculpture shows how trains have given way to newer (and sometimes more kid-friendly) forms of transportation. The work is s whimsical kinetic and interactive treasure hunt. Observant viewers will discover a dozen moving parts, including wheels and gears that spin, a rocking cow, trains that move, a piano player that spins, and B-2 bombers that fly. The addition to the restored Historic Katy Depot and the "Rails to Trails" project, the sculpture sits alongside the tracks at Sedalia's Katy Depot. 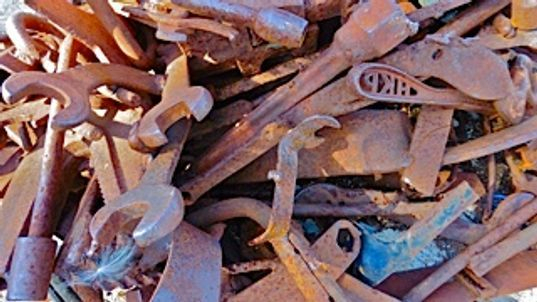 The sculpture project was jointly funded with grants received from the Missouri Department of Transportation Enhancement Program and the Housing & Urban Development Economic Initiative Program. 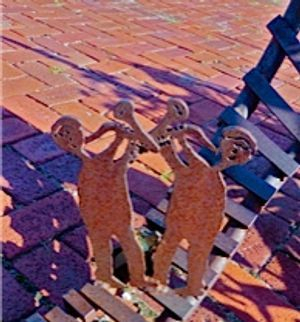 The Sedalia Heritage Foundation unveiled this public art piece on the grounds of the Katy Depot on Friday, June 4, 2004. 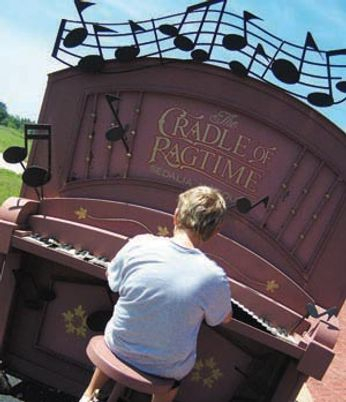 The piece pays tribute to Sedalia's Ragtime Heritage and serves as a complement piece to the Rag Tag Train public art piece that was dedicated in April 2004. Local artist, John Guffin designed and fabricated the piece titled "Syncopated Rhythm." Mr. Guffin who began a career in the construction business found himself with extra time on his hands during the slow months of winter when construction would hit a lull. During the winter of 1977 his son, Andy, was born and he found himself taking care of his infant son during the day while his wife worked. He found that he missed working with his hands and as soon as she would come home in the evening, Guffin would head to the basement and he began tinkering with motorcycle spokes. From the spokes he formed his sons name. From that he began a love of metal working. Today, he owns Guffin Metal Craft, which is based here in Sedalia. The art piece, which reflects Sedalia's Ragtime Heritage, features a turn-of-the-century piano and how it would have "felt playing ragtime." It is a life size piece that will offers great photo opportunities.